We know that the idea of taking your baby to the beach for the first time can be exciting, as well as intimidating. A baby’s first time at the beach is a complete new experience and being well prepared will make it an unforgettable time. In this article, you will find tips and tricks that will help you prepare for your trip, as well as what to expect of it. Sand can be a positive experience for you baby. It will introduce new textures and stimulate your baby’s sense of touch, but beware, sand can get in your baby’s eyes and mouth and even irritate her skin. To prevent this, make sure you take a large towel or blanket and place it on the sand. Let your baby stay on the center of it with some toys or snacks, this way, she will be away from the edge and less exposed to sand. If you let her play on the sand, keep an eye on her to make sure she doesn’t eat or rub sand on her face. If sand goes in her mouth, rinse carefully with water and use your fingers to try to get out as much as possible. If sand gets in your baby’s eyes, rinse with water, but never rub or let her rub her eyes, since this may cause more harm. Things can happen in the blink of an eye, and you need to keep them wide open at the beach. This doesn’t mean your baby can’t or shouldn’t get some sea fun. Your baby will love the water! You should take her exploring and put her little feet in the water, just be cautious. Never leave your baby unattended near the water, not even for a second, not ever. Whether it’s play or companionship, pets bring their owners’ plenty of joy. But did you know that the benefits go beyond cuddling and fun? 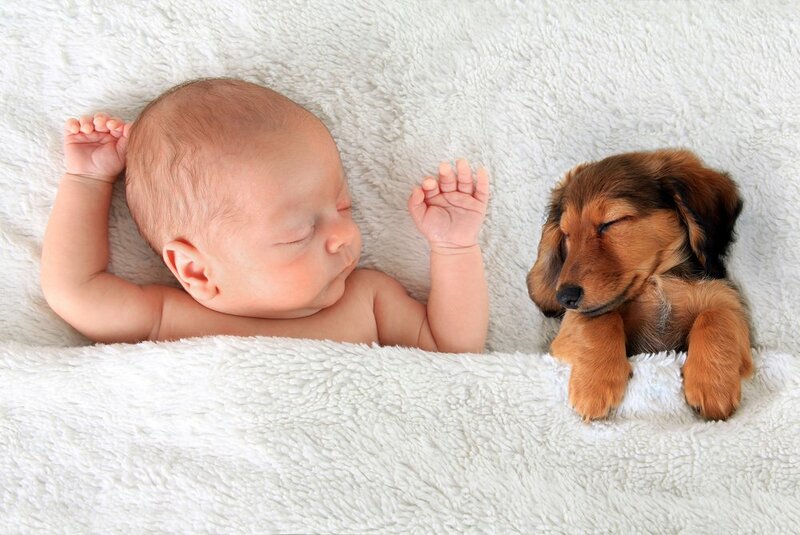 A new study showed that having pets can protect babies from allergies and obesity! At first, it may seem counteractive. Most parents want to keep their children away from furry pets, such as dogs and cats, due to allergies and sneezing. However, a research conducted by the University of Washington Department of Pediatrics found the opposite to be true. Contact with dogs early on, especially around the time of birth, can help the child’s immune development and reduce the likelihood of certain allergic diseases. In addition, a recent study by the University of Alberta showed that babies from families with pets –70% of which were dogs– showed higher levels of two types of microbes (Ruminococcus and Oscillospira) associated with lower risks of allergic disease and obesity. As a matter of fact, the beneficial exposure can even be transferred to babies who are still in the womb. Yes, you read correctly –moms can reap the benefits while being pregnant! The presence of a pet in the household during the mom’s pregnancy can grant microbial advantages to the unborn baby’s gut microbiome. No matter how careful you are, a fall might happen one day. You look away for a split second, and your baby can roll off the couch, bed, or changing table onto the floor. It’s easy to feel like the worst parent ever. However, you are not alone, each year in the United States alone, 2.8 million children head to the emergency room for injuries related to a fall. So if your baby falls, remain calm. Most of the falls are not serious, but you should learn about warning signs and what to do when it happens. Since your baby acquired more mobility, everything around him is a new world to be explored. 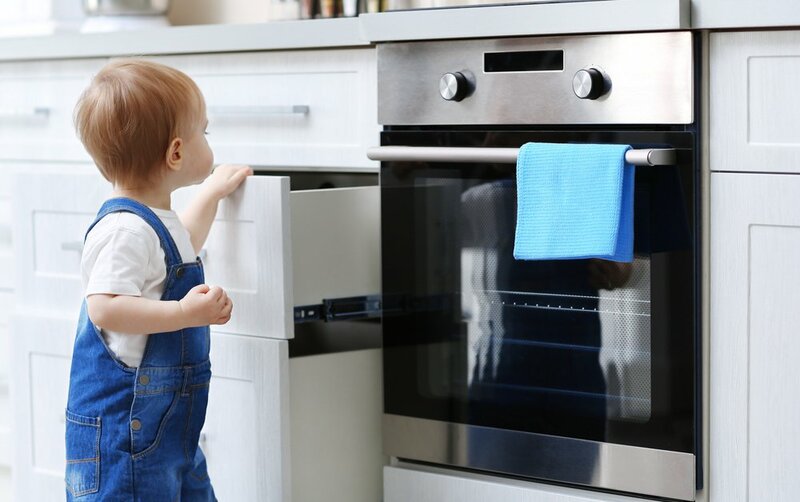 Your little one will move quickly towards objects that attract his attention, and they will not always be safe ones. 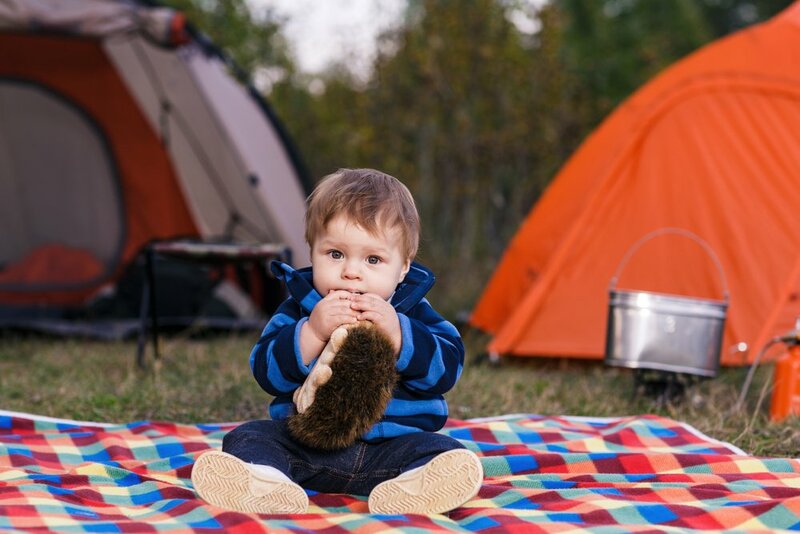 Your little one will begin to stand up with the support of a small table or a chair, and, naturally, small stumbles and falls will increase during this period. Don’t worry, the distance between your baby and the floor is quite small. When babies fall, they tend to turn to see your reaction before deciding on their own. Little ones constantly seek the guidance of adults whom they trust before proceeding with new experiences. With this in mind, you can help your baby understand that a little stumble should not keep him from exploring his environment. If despite your calm reaction your little one cries, don’t hesitate to comfort him and offer words of encouragement, so he can learn that, despite facing a small setback, he should keep going. Don’t leave objects on tables at your baby’s reach, especially glass decorations. Keep any cleaning item and medicine out of reach. Don’t have loose cables laying around. Make sure that no small object is on the floor; it will end up in his mouth. Close bathroom doors and kitchen access. Cover all electrical outlets, children love them. Always be attentive to your baby and never leave him alone. Finally, crawl around the room, see the place at your baby’s point of view, and verify that you have not forgotten anything. Now your baby is ready to explore freely and learn that a small stumble shouldn’t stop him. Happy explorations! If you have decided to return to work, you’re probably looking for a good daycare for your baby. Here are a few pointers to look out for to help you find the most suitable one for both of you. If location is something that’s important for you, look for a daycare close to your house or workplace. Research the daycares that get your attention and make sure they have a good reputation. Schedule a visit to each of them and try to talk to the parents of children attending the center. Make sure that the mood is warm and friendly, and that employees are trained as infant caregivers. Make sure they are loving and affectionate with your little one. Also, check to see if there’s one caregiver for every 3-4 infants and 4-6 caregivers for older children. Verify that the daycare is organized and has a suitable administration. It should have established opening and closing hours, but be flexible about the time you drop-off and pick up your baby. Ask about their first aid and emergency procedures. Do they have a separate nursery room for kids that may have some kind of contagious bug, like the flu? Review their naps and meals schedule, analyzing whether they are suitable for your child. Does my baby need shoes? If your baby is starting to walk, or shows signs that he is about to take his first steps, you might be wondering if he needs special shoes. During this stage, your little one doesn’t need to wear shoes. Now, of course you can choose to put on shoes so that he looks cute, to keep his feet warm, or to protect them from rough or dangerous surfaces. But shoes are not necessary to learn to walk or to strengthen his feet. 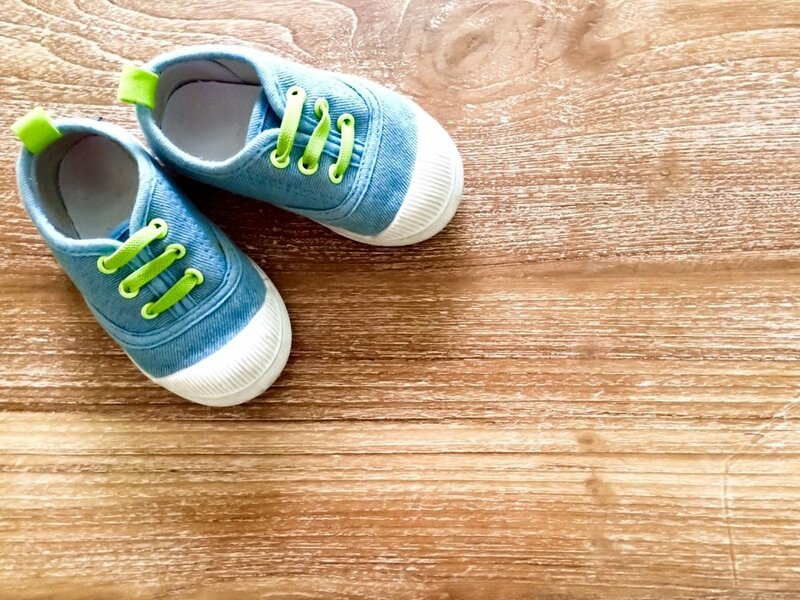 When children learn to walk indoors on a flat, safe surfaces, they don’t need shoes; in fact, it is beneficial for your baby to learn to walk barefoot. Walking this way, helps him strengthen his muscles and lets him move his toes freely. Although it might seem that he doesn’t have enough support or that his feet are flat, this is completely normal for his age. In the end, wearing shoes won’t help your baby walk better. What if he can’t be barefoot? Have a wide, round end that leaves enough space for his toes to to move. The inner lining has no seams and allows perspiration. They have flexible, non-slip soles. They embrace the foot but not too tightly. We know that sometimes, it feels as if your pet was your first “baby”. Loyal and lovable, pets bring a lot of joy to a family. 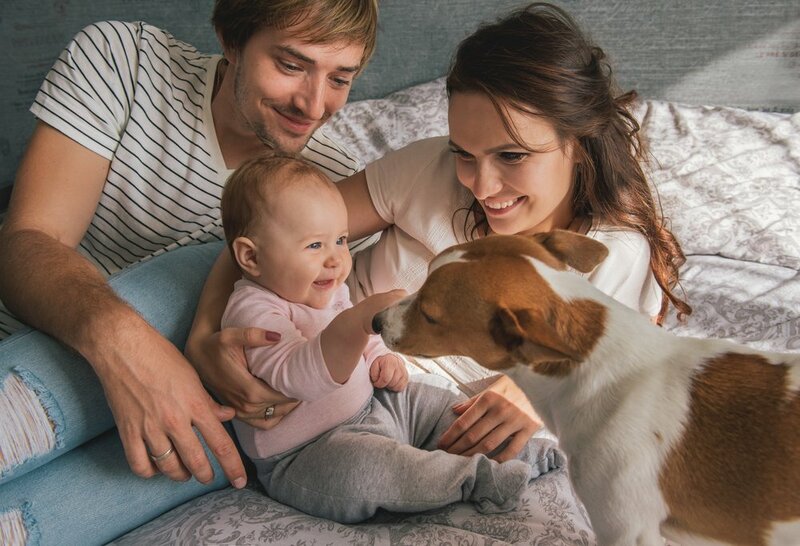 Here are a few tips to help create a harmonious relationship between your pet and your baby, and prevent accidents along the way. Sometimes, dogs that have been living with a family for a long time can be jealous or distrustful when a new member arrives. This can sometimes lead to aggressions. So try to be alert to signs including jumping at you, demanding your attention more than usual, or barking to your little one when you are with him. How can I prevent aggressive reactions? If your pet is a dog, train him. Although you might think training is unnecessary, it will make him more stable, predictable, and less likely to hurt your child. If you have the chance, show your pet one of your baby’s used garments so that he can smell it. Do this before he gets to know him, so he can get used to his smell. Pets are unpredictable and our little ones can be spontaneous too. Therefore, always be present and alert when your pet and your baby are in the same room together. Get your pet involved when you are with your little one, be affectionate towards him while you take care of your baby. If you notice any aggression against your little one, reprimand your pet immediately. If you have a cat, put a net over your baby’s crib to avoid unsupervised visits. We all know that spending an afternoon out in the sun without sunscreen is not a good idea. Getting sunburned is very painful and uncomfortable, and it causes skin damage. If this is the damage we suffer, imagine the impact on a baby! A baby getting sunburned is quite different from an adult. The same exposure to the sun is much more serious for them. It can cause dehydration, fever, blisters, heat stroke, and even become a medical emergency. Avoid direct sunlight when your baby is less than 6 months old. Dress him in light clothing that covers his arms and legs. Choose bright colors and tightly woven fabrics, so the sunrays can’t penetrate. Use a hat that protects his face, neck, and ears. Try to walk under the shadow as much as possible. Use a stroller with sunshade. Avoid going out between 10 am and 4 pm, hours when the sun is at its strongest. If you go out to have lunch, try to eat inside. If you can’t, look for the shade of umbrellas or trees. Don’t be fooled by cloudy days, despite not seeing the sun, the UVB / UVA rays will still burn your baby.